A couple of weeks ago I went to Maker Faire at the San Mateo Convention Center to help Ambidextrous Magazine promote their upcoming issue titled "Space." I was invited to put together a collage of the editors. Since the theme was "space," I decided to draw them as astronauts and aliens! 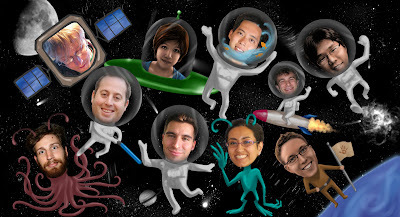 I started out with crops of each person's head, floating over a black background. Then I sketched out pose ideas for each of them, rotating heads to fit the composition of the big picture. The stars, comets, moon, and planets in the background are all Photoshop brushes that I once downloaded, but can no longer recall from where. Eventually, colors and other details were added, to yield this final product! 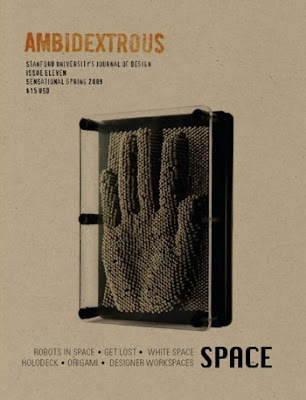 Ambidextrous is Stanford University's journal of design. I know a few people that work on it, and volunteered to help out with this image. The magazine is run entirely by students and features some really great articles on design and the design process. Most of the articles are written by professionals in the field, and cover a wide range of subjects about design concepts. If you are interested, check out their website for article previews! The questions they pose to the greater design community relate to the broader design process, and not just a single aspect like industrial or graphic design. For example, issue 10 ("Getting it On") covers topics from condoms to the evolution of the zipper. One thing I really like about the magazine is that each issue has a centerfold called Functional Dissection where they take apart some device and document the process. In issue 8 ("Secret"), the Ambidextrous team took apart a combination lock to show us what made it click. Other issues broke apart roombas, polaroid cameras, and even a nail gun. If you are interested in reading more about Maker Faire, check out my friend Paula's recent blog post at Quite Curious! She provides a great account of it, and has some great photographs as well.